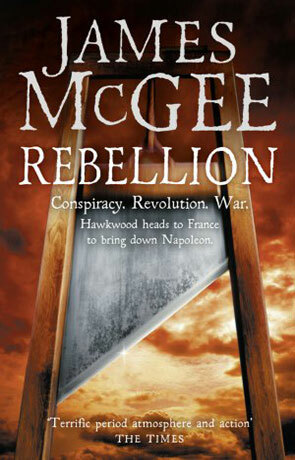 Rebellion is an historical fiction novel by James McGee and follows the adventures of Matthew Hawkwood as he heads behind the enemy lines in Napoleonic France. October 1812 sees Britain and France still at war, France is engaged with both Spain and Russia and fighting a battle on two fronts is proving very weary for the countries citizen's - rebellion is brewing but there have already been several failed attempts to overthrow Napoleon Bonaparte since he appointed himself as First Consul. I don't get chance to read much fiction outside the realms of sci-fi and fantasy so when the opportunity arose to review a historical fiction novel I jumped at the chance. I haven't read any previous James McGee books but they have caught my eye a number of times in bookshops (Ratcatcher and Rapscallion spring to mind) and so I review this novel with a fresh perspective. I must admit I thoroughly enjoyed the whole experience, I have read a number of novels set in the same era - most notably Bernard Cornwall's Sharpe series (which I also fondly remember watching on TV in my younger days) and Rebellion is up there with the very best of them - Hawkwood feels somehow a more complete and realistic character than Richard Sharpe ever did and this realism is prevalent throughout the novel (Sharpe always felt a little too predictable and each story had almost the exact same structure). Comparison's with Cornwall's series appear inevitable due to the same strong male lead and attention to historical accuracy - the story here focuses on the "Malet conspiracy" of 1812 and to me it seems very accurate and true to the real events of the time which is fairly well documented and occurs during Bonaparte's disastrous Russian Campaign which see's his own people starving in the streets to fuel his warmongering. If you desire to learn more I urge you to look up the facts AFTER you have read the novel otherwise it could spoil the plot. Hawkwood is a complex and fantastically researched character, enigmatic and completely engaging - one of the highlights of the novel. I also love the descriptive fight and battle scenes which manage to be both evocative and exciting without going over the top in the gore stakes. The story is immersive and the plot swift enough for me to read through the whole book in just a few sittings (all 500 plus pages) although the first third of the novel does suffer a little with the setting of the story and back history of the major characters, this is alleviated somewhat with plenty of intrigue and quite colourful characters. Overall Rebellion is an exemplary example in the historical fiction genre, well researched with an absorbing story and a complicated and compelling protagonist, recommended. Written on 28th April 2011 by Ant.